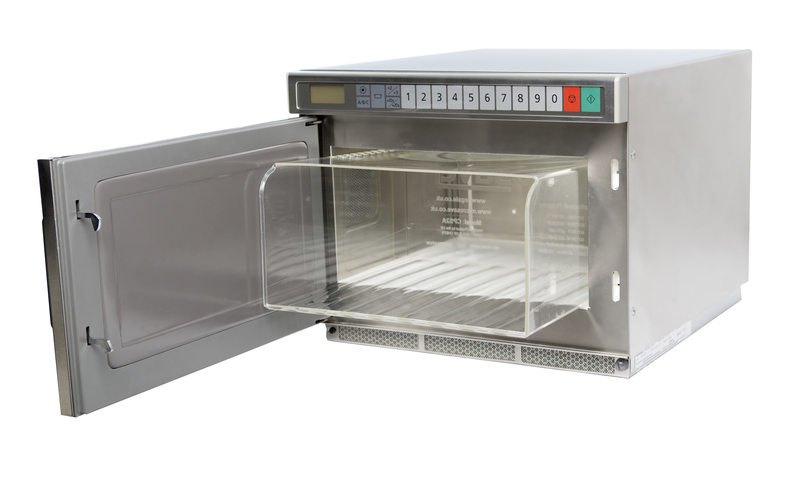 With many years of expertise in microwave ovens Cavity Protection Systems has developed a unique solution to extend the life of your microwave, reduce costly repairs and save you time maintaining its clean interior. The Cavity Liner is a specially developed rigid liner that can be removed, washed at the end of service and replaced for use time and again, avoiding any cross contamination of burnt food particles, making the microwave interior much easier to clean, avoiding down time and costly repairs. Made to outlast the average commercial microwave oven and, with a price tag less than the typical cost of a repair, this innovative piece of kit is already cherished by many kitchens across the industry. Not only is it proud to be ‘made in England’ but has NSF worldwide certification too. Regale Microwave Ovens Ltd is proud to be a wholesaler for the brand new Panasonic NE1878, which is a revolution in the microwave world. It is a compact high powered 1800watt output microwave oven that has a stainless steel outer door, ideal for front of house as well as busy kitchens. Sporting a steel inner door, it helps to cut down over 90% of door faults. Along with latest inverter technology, this means that it is the lightest high-powered microwave oven on the market at only 20 kilos – it doesn’t have heavy transformers. The inverters give a much smoother cook pattern (meaning no cold spots and that it cooks much quicker than the standard 1800/1900 watt microwave) and the energy saving is a massive 6% over conventional microwaves ovens. Another big plus is that we have designed a brand new Microsave® CPS3A Cavity Liner for the microwave that fits snugly in the cavity making it the ultimate 'clean machine'. The Microsave® Cavity liners have taken on a “new look” with a Wave Base Design and are also in new modern white packaging all with bar-code for the brand new range. This now means there are five models in the range: the CPS1A for the SHARP R24AT, R23AM and the R22AT; CPS2A for the PANASONIC NE1853 and 1843; the CPS3A for the brand new PANASONIC NE1878; CPS4A for the SAMSUNG CM1929, CM1919, CM1529 and the CM1519; and CPS6A for the DAEWOO KOM9F85, KOM9F85/60hrtz (marine) and the KOM9F50 for which Regale Microwave Ovens Ltd are proud to be the sole importers for the entire range of Daewoo commercial microwave ovens, which includes the KOM9P11 (1100watt), KOM9P11/60htz (1100w marine) plus the KOM9M11S (1100watt manual control with the start button to safe guard the oven being switched on empty). The current range of Microsave® Cavity Liners also fit earlier models of the microwaves above and for full details please contact us for information of our full range of commercial microwave ovens, high speed cooking ovens and the Microsave® Cavity Liners. Telephone 01329 285518 (five lines) - www.regale.co.uk - and our new website www.microsave.co.uk where you can buy a Microsave® on line. Receive 10% off the price of your liner or get a FREE liner when you purchase a commercial microwave from Regale, our associate company. Just call 01329 285518 and quote “CGMEM”.